Black Friday and week-long sales campaigns are not as new as we might think. 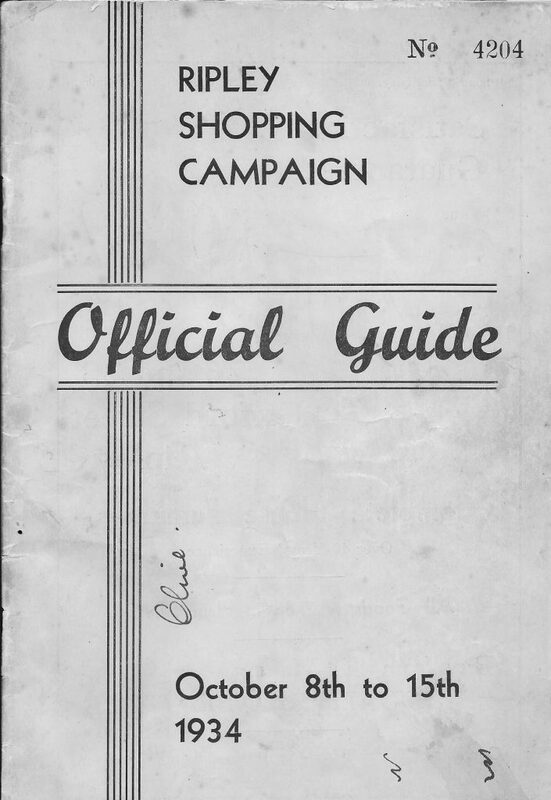 In Ripley, for example, October 8th-15th was Ripley Shopping Campaign Week, in 1934. There was a 64 page booklet to accompany the campaign. There was a competition to spot window display items that didn’t belong with the shop’s trade. In the example in our archive, the person filling in the form found strawberries in the window of Leafe’s butchers, a paper clip in Clower’s Builders Merchants (and how did they spot that?) and a mouth organ in the window of Frank Jowitt’s wireless dealers. There was also a children’s’ essay competition and a form to cast your vote for the best window display. And, of course, adverts, for all of the 65 shops described in the booklet. They were very plain: a few simple graphics and just one photograph in the whole booklet. Some of the text seems very formal by our standards, though some tried different approaches: “It’s Busted! 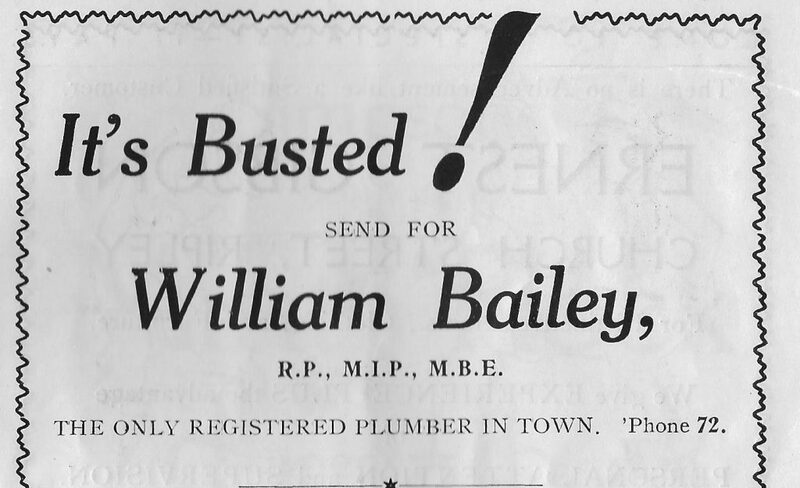 Send for William Bailey, the only registered plumber in town” and Keeling’s “A Touch of the Lonely Moor amid the Heather and the Gorse” promoting their Tweed coats. There was a spoof diary of a Councillor in the style of Samuel Pepys, and a “wireless report” (a sort of Twitter of its day), featuring Radio Heage and the Fritchley Highlanders Orchestra. Each of the “Leading tradesmen” (so called, although a fair proportion were women) had a short paragraph describing their offerings, from Messrs G.C. Brittain & Sons, the “largest stockists in town of novelties, stationery, sports equipment and toys” to Redferns, “the complete drapers” and Mr W. E. Clarke , “a specialist in ladies’ and gentlemen’s clothing”. A few also had shops in Alfreton or Belper, but most were owner-run independent shops. Strangely, the Co-op does not get the slightest mention, though it was by far the biggest retailer in the town, with half a dozen different shops, a department store, bakery, wet fish shop and so on. It would appear that the Ripley Town and Trade Association, who published the booklet and organised the campaign, and who represented the 65 independent local shops were trying to reassert themselves in the face of the mighty Co-op. Quite how the campaign’s slogan “Spend to Save” made sense, however, it is hard to see. In a rather more innocent way, it was probably the same argument applied to today’s Black Friday, Mad Monday, Terrible Tuesday and so on.